Hello stitching friends! 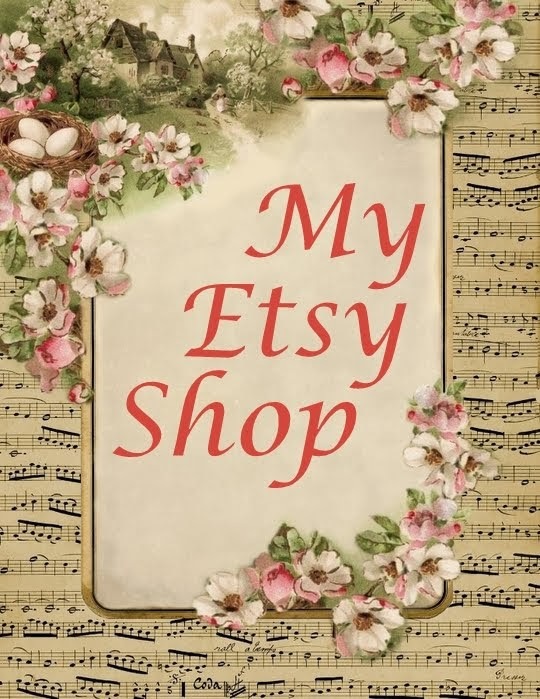 It has been so long since my last stitching update - we have had such internet connectivity problems over the past few months - I just hope this post makes it safely into blogland! It has cooled down a bit here in Cape Town over the past few weeks and we are definitely moving into Autumn! There is even a slight chill in the air in the evenings and we have had some rain - such a relief after a terribly hot summer! Even though I haven't been blogging I have been stitching! Michelle from StitchCraft Place and I have been enjoying our Tuesday evening SAL every week! We are stitching the Isabella Donald sampler from the Spring 2012 issue of the SANQ magazine. I have substituted the charted colours with my own choice of Madeira silk and I just love how it's turning out! I have also been working on the 'Bambu by Mamen' SAL as hosted by Ticoeur on her forum. New steps become available twice a month and I always look forward to see which part we'll be stitching next! 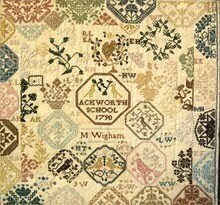 I can't wait to get back to this sampler - I just love working on it! I am also working on a few Easter ornaments to be sent as gifts, so I can't show them yet! I am taking part in the Easter Egg-change hosted by Mii Stitch. This is my first exchange and I'm so excited to take part! Well, that's my stitchy update for now! SAL Start and HAL Progress! Hello stitching friends! Oh my, it has been so hot over the past few weeks, I can't wait for the first signs of Autumn, even though I know how hot February and March can be! Last week there were a few evenings that were too hot to do anything, even stitch, followed by nights that were too hot to sleep, leaving everyone feeling absolutely drained. On to more pleasant things - stitching! The design is actually charted in grey and soft purples, but that does not suit my decor, so I changed it completely! It is not a reproduction sampler, but compiled from different samplers from the same era. Some of the inspirational samplers are shown in the magazine and I really liked the colours of the 1825 Kildare School Sampler. I was fortunate enough to have some Madeira silks in the deep red, gold and blue and soft green shades. I am stitching it on a natural 28 count evenweave and I'm very satisfied with the way the silks look on the fabric. Here is a slightly closer view - I love the combination of soft pinks and ecru! At least the hot weather is good for one thing - my roses just keep on flourishing! Here is a picture of a beautiful soft pink rose - it also has a lovely delicate fragrance! That's it for now! It's almost Friday - have a good weekend and Happy Stitching! Celebration Sampler Progress and a SAL! Hello dear blogging friends, I hope the first few days of 2014 have been treating you well! I am so happy to have some stitching to share with you in my first post of the year. I have made a little progress on the Celebration Sampler, which was featured in the Just Cross Stitch Magazine in 2013. Here is my progress so far, the words look a bit funny at the moment, but will make more sense once I put more stitches in it! It is such a pleasure to stitch, I am really enjoying it - here is a close up of the Bargello section - always so much fun to stitch! This year I decided to join a SAL for a beautiful Hardanger piece by Mamen, which is kindly being hosted by Ticoeur on her forum. The piece is called 'Bambu' and I'm stitching it on 28ct antique white Quaker cloth in DMC perle thread. Here you can see my first step and the threads that I'm using - I decided to break away from 'tone on tone' Hardanger stitching and I'm having great fun with the lovely pinks! I am also starting another SAL on the 1st of February with my dear friend Michelle from the UK. 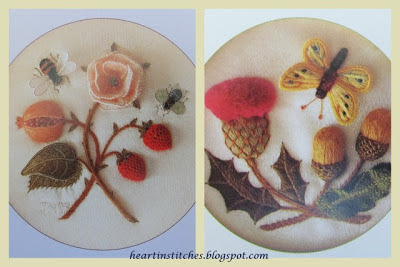 There is a lovely sampler in the Sampler and Antique Needlework Magazine (SANQ) that we both want to stitch - I'm really looking forward to our SAL! In other needlework news, I have been working on a quilt! My cousin in Oregon had the most precious baby boy last year and I am making a quilt for him - the quilt top is made and the basting is done, now I have to machine quilt it. I will show photos in a few weeks (after they have received it), since they haven't seen any photos yet - only snippets of fabric! 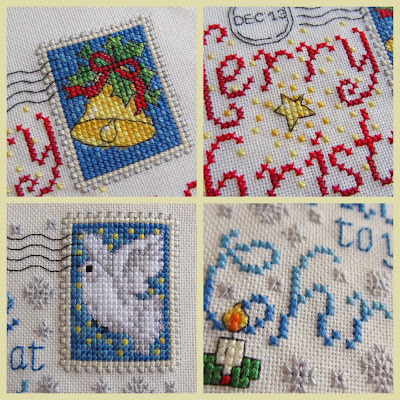 Last Christmas Stitches for 2013 and a Sampler Start! Hello stitching and blogging friends - I hope you all had a wonderful Christmas! Here are my last Christmas stitches for 2013, these beautiful postcard style pieces were featured in a World of Cross Stitching Magazine. I did not manage to do the finishing in time for Christmas as they turned out to be very time consuming to stitch, with lots of quarter stitches and back stitching. They are stitched on 28ct antique white Jubilee in DMC stranded cotton. I also have (another) new start - I decided not to wait for the new year to start this piece! It is called Celebration Sampler and is featured in the Just Cross Stitch Magazine as part of their 30th anniversary this year - it is a six part sampler and runs over a few issues. I'm stitching it on antique white 27ct Linda in DMC threads. It does not look like much now, but it will be a beautiful band sampler with some specialty stitches. I am really enjoying this project so far, even if I still have to chart my name into the blank space between the bands - my name and surname just won't fit into the allotted space - the sampler is quite narrow! We have been 'enjoying' a typical hot, sunny South African summer, which means my roses are in full bloom. I would like to end my last post of 2013 with some photos of one of my favourite roses from my garden. It is called 'Blue Bayou' and has the most beautiful silver lilac flowers. Well, that's it for 2013! Wishing everyone a wonderful New Year! A Small Finish and a Large Start! Good day stitching friends! I have been getting into the Christmas spirit with some ornament stitching! This piece by Homespun Elegance is featured in the 2013 Just Cross Stitch Ornament Issue. It caught my eye immediately! It is called 'Majestic Bird' and I stitched it in DMC colour variations (the red) and Nina's threads (the green). The bird is supposed to have a crown charm in his beak, which I changed to some stitched holly and ivy. It is stitched on 28ct self-dyed evenweave and is finished as a simple hanging ornament, backed with the green fabric pictured. I also have a rather large start to share. 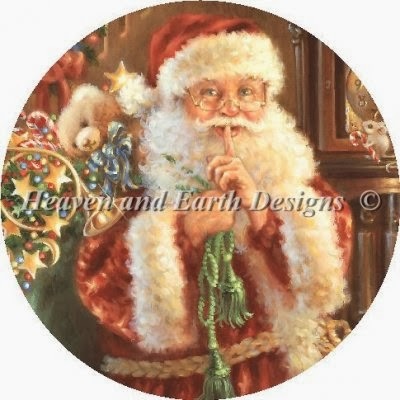 I have been wanting to stitch one of Heaven and Earth Designs Christmas ornaments for a while and finally decided to stitch 'Not a Creature was Stirring' by Donna Gelsinger. It does not look like much yet, but I am really enjoying it! I am stitching it 2 over 2 on 28ct parchment evenweave, so it won't be ornament size, but rather a size more suited to framing. Here is what the painting looks like, isn't it beautiful? I have been spoiled by Michelle from StitchCraft Place again - this time with a Christmas gift! She sent me a gorgeous Christmas card, some limited edition sampler thread from The Gentle Art and some special Christmas tea. Thank you Michelle! That is it for today, enjoy the rest of the week and Happy Stitching! Hello dear blogging friends! Oh my, has it really been that long since my previous post? I trust you are all keeping well! I am slowly winding down from a very, very busy year and I'm so happy to be blogging again. Here is a close up of the chart - it is so cute and definitely on my 'to do' list for next year! Thank you so much Michelle, I absolutely love the gift! Here is a close up of some of the sweet peas - the scent is just heavenly! I have not been able to stitch as much as I would have liked to over the past few months, but did manage a few small finishes (and perhaps a large start! ), as well as a few other projects. I will share some pics soon! Good day blogging friends! Oh my, has it really been that long since my last post? I am certainly not keeping up with my goal to blog more often this year. Winter has really set in here in Cape Town and with it an array of colds and flu! DH, my mom and the in-laws have all been ill and I have had flu twice! I hope I have now built up enough resistance for the rest of the year! It has been slow going on the stitching front; I have been working on a few gifts and a few small items, but have nothing to share at the moment. Since I don’t have any new work to show, I decided to share some of the Stumpwork pieces my mom did years ago. 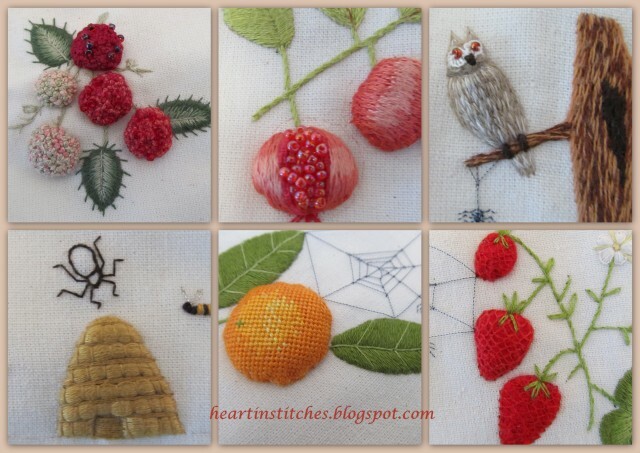 Stumpwork is a style of embroidery where the objects (usually flowers, fruit and animals, but sometimes even people!) are raised from the surface of the foundation fabric in order to create a three dimensional effect. Stumpwork originated between 1640 - 1700 and appears as if it was originally utilized in Biblical embroideries in Europe, it was later done by young girls in England as part of their education. Stumpwork often makes use of wire to add dimension - usually to leaves, petals and wings. Padding is also frequently used, as well as felt which is then covered in embroidery stitches. One of the most interesting things about Stumpwork is the complete disregard for scale – a single berry can be larger than a squirrel! Thus, Stumpwork is technically raised work, whereby figures and padded objects, as well as other loose objects are stitched onto a main fabric which has been prepared with a 'base' of surface embroidery. Now, on to some examples -this piece is called ‘Nature’s Circle’. My mom stitched this piece in 1999, after which she presented classes on the technique on behalf of the designer. It was a very proud moment when three of her students won 1st, 2nd and 3rd prize in a national embroidery competition (the theme for that year was Stumpwork). Let me tell you, the first prize winner’s work was so perfect, it looked as if it was done by machine! The squirrel is definitely one of my favourites! I just love the fluffy tail :) Some juicy oranges are pictured in the background and as always, there is a little critter sneaking about! Here are some examples from an unframed piece my mom designed and used as a teaching aid - please note that the piece is not finished, so all the elements are not added and completed! The raspberries are so beautiful and mr owl so cute - look at the little spider dangling from the branch (I do like the critters)! 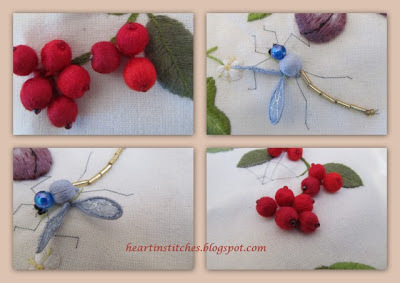 More examples of cherries and a dragonfly with not yet completed wings! Can you believe that, despite having a teacher in the house, I have never tried my hand at stumpwork? Here is an example of some of the smaller projects in the books - perfect for beginners and so pretty! The pomegranate, rose and strawberries in the first picture work so well together and I just love that big bushy thistle in the second picture! I also know that some of the older Embroidery and Cross Stitch magazines (their name has since changed) featured stumpwork projects. Well, that was a really long post for me! Hopefully I will be back soon with some stitchy updates!